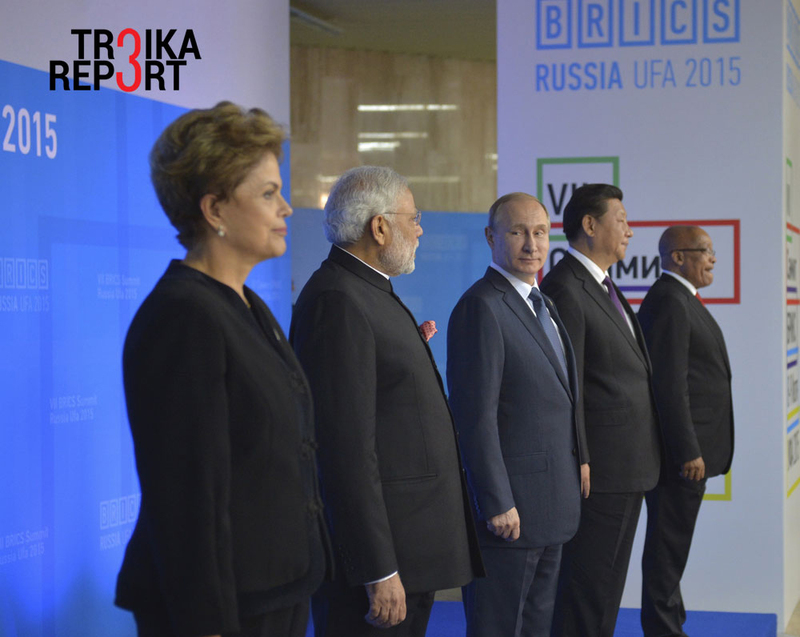 Brazil's President Dilma Rousseff, Indian Prime Minister Narendra Modi, Russian President Vladimir Putin, Chinese President Xi Jinping and South African President Jacob Zuma at the BRICS Summit in Ufa, July 9, 2015. The BRICS grouping is falling apart, according to a recent article in the Financial Times that claimed commodity giants Russia and Brazil are being outperformed by other emerging economies that are attracting better investment. Does BRICS have a future or will the changing economic climate see it sidelined by new groupings such as the so-called TICKs? Russia was conspicuously absent on the name list of the Trans Pacific Partnership trade alliance, with the deal signed – though not yet ratified – by 12 nations in Auckland (New Zealand) on Feb. 4. Moreover, less than a week earlier theFinancial Times sounded the death knell for the BRICS, predicting that the grouping will soon be replaced by a new union nicknamed TICKs, made of Taiwan, India, China and Korea (South). Does this amount to a significant change in the evolving economic pecking order? Will it eventually, if the newspaper’s “Cassandra” Steve Johnson has a point, leave Russia on the margins of global investment flows and the highway of hi-tech growth? First of all, under the pressure of U.S. sanctions, Russia actually had no chance of being included in the new trade bloc, comprised of the U.S., Japan, Malaysia, Vietnam, Singapore, Brunei, Australia, New Zealand, Canada, Mexico, Chile and Peru. While in total, the 12 countries account for some 40 percent of the world's economy, there are several regional “locomotives” of growth that are not included in the grouping, e.g. China, South Korea, and Indonesia. Russia, which along with the other BRICS nations, regards unilateral action as antithetical to a multipolar world order, does not fit in for ideological reasons and prefers to lean toward the China-promoted trade alliance. After all, Beijing has never demanded “regime change” in Moscow or the correction of Russia’s internal and foreign policy as a precondition for partnership. The claim by the Financial Times that the BRICS organization is falling apart is based on the statistics of “deepening recessions in Brazil and Russia,” facts that are indisputable, just like the recorded preferences of foreign investors, who are now targeting to a greater extent lucrative high-tech sectors in other emerging economies. The newspaper’s conclusion that “tech-heavy Taiwan and [South] Korea [are] elbowing aside commodity-centric Brazil and Russia” might well be a correct assessment of the state of play. However, Steve Johnson admits that “one unanswered question is whether this trend reflects an underlying structural change or whether it is purely cyclical.” Since the Financial Times author is uncertain of the validity of his main argument, the final verdict that the “BRICS are dead” is also subject to doubt. It is worth noting that, despite striving for objectivity, after the acquisition of the Financial Times by the Japanese publication Nikkei, the BRICS section in the reputable daily was removed, while articles dealing with the economic and financial performance of China, Japan’s arch-rival in the region, have acquired carefully veiled emotional undertones, indicating an explicit underlying desire to bury BRICS. Putting together, in a Lego-style fashion, the four countries of the so-called TICKs will not mould them into a formal alliance, especially in view of Taiwan being still seen in Beijing as a breakaway “rebel province” of China. However, it should be borne in mind that BRICS is not an alliance either. Moreover, under pressure from the low-price environment on the global commodity markets, Russia has been roughly awakened to the need to reshape its economy and part with its over-dependence on oil and gas export revenues. A consensus of the elites has been reached, at last. True enough, the pace of reforms has been slow. But with no alternative for survival in an increasingly competitive world that is fragmenting into multiplying regional trade and economic blocs, Russia will inevitably choose to pursue a hi-tech, innovative and knowledge-based economy. The focus, as already proclaimed by the authorities, would be to capitalize on “champion” sectors producing “added-value commodities” like nuclear power generation, aircraft and spacecraft design and production and sophisticated military hardware, as well as pinpointing such promising areas as biotechnology, the production of new materials capable of changing the future of manufacturing, and robotics, not to forget the single most dynamic sector – services. As for BRICS, looking wider afield, this informal alliance will persevere not only for the purpose of extracting benefits from international cooperation but also to serve as an insurance that no one will attempt to find the way out of the current global economic woes in the worst possible scenario: all-out trade or currency wars that could tip over into real hostilities. To a certain extent, BRICS has been already built into the system of checks and balances of the existing world order. The current, and most certainly temporary discrepancy in the economic performance of its five nations is irrelevant to BRICS’ credibility and perspectives.